The Central Role of Advertising In The Customer Journey? When you think of advertising, your first association might be with attracting new customers. Ads are supposed to reach out to audiences unknown, introduce them to your brand, and bring them on board. But in reality, advertising can be used effectively throughout the customer journey. It’s not only a tool to reach prospective clients; it can also keep those you’ve already converted around for many years to come. I’ve talked a lot in the past about the marketing hourglass, and while you’re undertaking that approach to marketing on the whole, you can incorporate advertising into each of the seven key steps along the hourglass. Before someone ever becomes a customer, they will first need to come into contact with your brand and decide that you’re offering a product or service that’s unique and that will serve their specific needs in a way that no one else can. If you’re looking to reach prospects, you want to target people who are similar to your current customers. It stands to reason that those who will have similar needs and wants to your current clients probably also have other similar attributes (age, location, budget, etc.). Online advertising tools have become increasingly advanced and allow you to direct your ad spend only at those who are most likely to want to know and like your brand. Facebook offers a service called lookalike audiences, where business owners are able to upload the contact list of their current customers, and Facebook in turn identifies people with similar attributes for you to target with your ads. Google Ads offers business owners the ability to target users by geographical location and by those who are searching for specific keywords. The key to advertising to prospects is knowing and understanding your current clients. The more data you have on them and their habits, the more likely you are to be able to hone in on a similar audience who would be more than happy to stumble across your business. Once someone becomes aware of your company, they move a bit further along the marketing hourglass to the trust and try stages. Here, you’ll want your advertising efforts to help users build confidence in what your brand can do, and to give them an opportunity to take what you’re offering out for a spin. A key part of a prospect developing trust in your business is seeing you around consistently. The mere exposure effect in psychology says that people are more likely to trust someone or something that they see over and over again. Advertising across various channels (both on- and offline) will help to keep your brand front and center in prospects’ minds. This also means that part of your advertising strategy is just about hanging in there. If you don’t see results right away from your advertising spend, don’t throw in the towel. Sure, it’s fine to tweak your approach, but scrapping the entire thing will take your business off the radar screen of those who might have been interested in giving your product or service a try if it had only popped up on their screen one or two more times. Once prospects have seen you around and you’ve piqued their interest, they might want to take your product or service out for a test drive before committing and converting. Providing offers for free, advanced content like an eBook or access to a webinar, or giving prospects a free trial option can be the final step before converting. While I’d suggest that you take a more personalized approach to your interactions with prospects, it’s also possible to include offers in more general advertising. Just be sure that when you’re targeting specific people with personalized messaging, you’re offering something that isn’t generally available to anyone coming across your advertising. Congratulations! Your earlier advertising efforts were successful, and you’ve now gained your newest customer. But your work is far from over—now your focus needs to be on keeping the customer experience high. Once someone has converted, your contact with them can be much more specific and personalized through other marketing channels, but it’s still possible to use advertising to keep current clients happy, have them coming back for more, and (most importantly) telling all their friends about you. One of the most important things for creating repeat business is staying on-brand in your advertising. You’ve worked so hard to get in front of these customers and to win their trust, so you want to continue to hammer home your mission statement and keep your messaging and voice consistent so that your customers feel like they really know and understand your company. This helps to reinforce your trustworthiness, and will make those customers all the more likely to come back themselves and to become a referral engine. You can also use these loyal customers as a part of your advertising efforts. Including testimonials from those who are already brand-loyal in your advertising campaigns can help to win over those who are still in the trust phase of the hourglass. Indeed, 70 percent of people say that they’re influenced by other consumers’ opinions shared online. Advertising can be a powerful way to reach your customers and prospects alike. Advertising can be seen by and have an influence on people no matter where they are in marketing hourglass. Identifying the proper audience for your advertising efforts, creating a consistent message that builds trust, and staying top of mind with both prospects and current clients will ensure that you get the most out of your advertising dollars. Marketing is a broad term that encompasses a number of channels and approaches. Advertising is just one of them, and in our increasingly digital age, it can sometimes feel like a tactic of the past. However, when advertising is used properly, it can become an effective lead generation tool. Below we’ll take a look at both online and offline advertising and explore the best ways to harness each approach to generate leads. Online ads are a highly effective way to generate leads because you’re able to collect and access so much information about your customers when they interact with you online. And the major players in the online game are making it easier than ever for you to create online ads that are highly targeted. Facebook and Google are the two major players in the space, and they offer small business owners all sorts of opportunities to better understand their current users, find new potential clients, and generate leads and conversions. They do this by providing highly-granular analytics on all of their users and by allowing you the opportunity to customize your advertising approach and target market. There are a few critical steps any business owner should take before starting an online marketing campaign to ensure they’re going to get the most out of their approach. You can’t possibly know who you should be targeting without knowing the demographics of your current client base. How old are they? Where are they located? What’s their income level? This is the kind of demographic information you should be collecting on your current clients. You can also get information on prospects with tools like Facebook Pixel, which allows you to track visitors’ behavior on your own website so that you can send them targeted ads on Facebook later. Once you understand more about the people who already use your service or have expressed interest in your website, you’ll want to go after those specific people with online ads. Facebook and Google also make it easy to target people who might not have encountered your business yet, but are similar to those who already interact with your business. 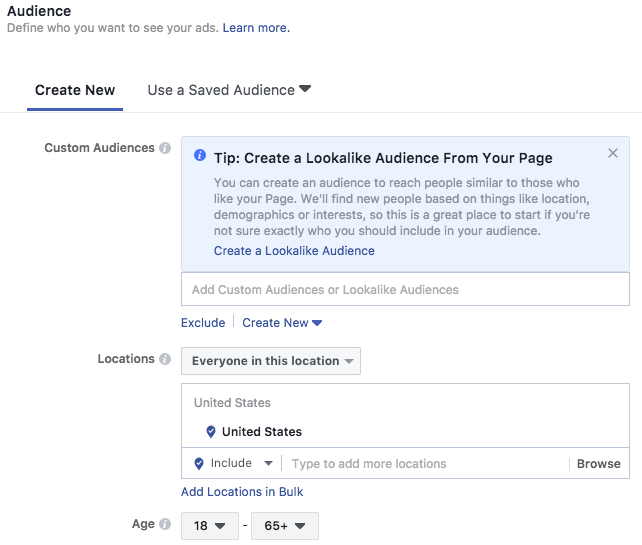 Facebook’s lookalike audiences allow you to present your ads to those who have attributes that are similar to people already on your mailing list. 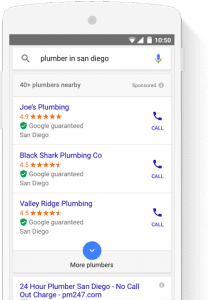 And Google Ads allows you to advertise by location, while tools like Google Local Service Ads put you in front of potential leads right as they’re looking for the service you offer. Google and Facebook both offer robust analytics on how many people are seeing your ads, whether they’re then visiting your website, and if that is resulting in a conversion. You should be keeping regular tabs on these analytics so that you can easily catch and solve an issue, or jump on a successful approach and amplify that across other channels. Based on what you’re seeing from the analytics, you can go in and make strategic changes to your approach. A/B testing is regularly used in website design, but the principles can be applied to advertising as well. If a campaign isn’t succeeding, make a change. This might be a change to the content, the delivery method, or the demographics of those you’re targeting, but whatever changes you implement, make them one at a time so you’re able to see how each change moves the needle on the campaign. If you hit on a successful tactic that results in leads, apply that across your other channels. The beauty of online advertising is that if something isn’t working, it’s possible to change it quickly, easily, and without great cost. While there is great value in creating effective online advertising campaigns, a robust advertising approach will also incorporate offline ads. And while you may not have the specific analytics to see precisely how your offline ads are performing, there’s still immense value in investing in print, television, radio, and direct mail. With offline advertising, there’s usually more upfront cost involved, and once a print ad or radio spot is out there, you can’t make modifications. All of this means that there’s value in taking more time up front to be strategic about your approach–you really can’t skip the research step here. However, many of the same basic principles from online advertising should also be put into use offline. Different types of customers will interact with different kinds of offline media. That same demographic information you needed to establish a successful online campaign can help you to determine the type of offline campaign that will afford you the greatest reach with the types of customers you hope to find. If you run an auto repair shop, it might make more sense for you to create radio spots, as people tend to listen to the radio while they’re driving. If your target customers are millennial men, consider running your ad during the college football game on your local sports network. Understanding your customers allows you to hone in on a broader audience that will likely have a similar interest in your product or service. It’s more difficult now to approach offline advertising because a lot of people are conditioned to ignore it or have the means to avoid it entirely (DVRs and streaming services, for example, allow you to skip commercials entirely). This means you’ll need to get creative with your approach. Forget the 30 second radio spot; have you ever thought about texting as advertising? There are lots of possibilities out there, if you’re willing to think beyond the traditional. Hiring an advertising professional is a worthwhile investment because they understand the landscape, the latest trends, and can create a campaign that really stands out. It is possible to get a broad sense of how your offline advertising is being received. While it’s not the same as the incredible detail you can get from online analytics, you can get useful information about how your campaigns are playing offline. If you’re launching a new print or direct mail campaign and include an offer, provide a unique code that allows you to track how new leads who approach you came across your business. There’s also value in creating a brief survey for those who sign up for more information on your website. Simply asking “how did you find out about us?” and listing your individual offline advertising efforts below can provide you with insight into where leads are coming from. Armed with this information, you’ll be able to focus your efforts more on the medium that’s working best, and over time can gain insight into the campaigns and approaches that prove most fruitful. No matter what advertising approach you choose to take, understanding the results of your advertising efforts is what’s going to lead you to create more effective campaigns in the future that will generate more and more leads. Taking the time to know your audience up front and gather more information as the campaign unfolds will empower you to make the most out of your advertising approach. If you’re a small business out in the world today, it can feel like your competition is everywhere. The ubiquity of the internet means that anyone, anywhere, can turn to any provider to get the goods or services they need. In an environment like that, what can you possibly do to stand out from the crowd? In the past, advertising was the cornerstone of any plan to get your company’s name out there and to attract new business. However, with giants like Google now committing to filtering ads, and with customers being turned off by loud pop-up videos and irritating banners blocking a site’s content, focusing exclusively on advertising is becoming a less sustainable marketing model for businesses. So what’s the alternative? Here we’ll take a look at paid content: what it is and what it can bring to your business. Why Turn to Paid Content? Content marketing is essentially a way for you to create deep connections with customers, establish yourself as an industry expert, and thereby drive sales. This content can be anything from blog posts to podcasts to e-newsletters. Whatever form the content takes, it’s critical that it’s high-quality, informative, and results-driven content that really solves a problem your potential clients have. If you prove through your content that you understand their needs and that you have a means to meet them, you can become their go-to source for whatever good or service you provide. The challenge, then, becomes getting that content in front of the right people. You know that old adage “If a tree falls in a forest and no one’s around to hear it, does it make a sound?” Same goes for content creation. You can be turning out some really impressive work, but if no one’s seeing the content you’re creating, it’s not doing anything for you. Getting your content out there to a broader audience is exactly why some companies turn to distribution platforms. These platforms allow you to set a budget and timescale, and from there they work to put your content in front of a targeted audience that will find it the most interesting and useful. We’ve discussed this approach in the past, and while there are a lot of platforms for you to choose from, some of the most popular are covered here. Distribution platforms will provide you with analytics, so you’re able to see which content is getting the most traction and can tailor your approach as you learn more about your audience. The greatest downside to these types of platforms is that the content still lives on the margins of web pages. Often located below the site’s content, they look like paid content, which may turn some potential readers off. If you’re concerned about the look of content on a distribution platform, you may want to consider sponsored content instead. While perusing your favorite online magazine or newspaper, it’s likely that you’ve come across a story that’s sponsored by a brand. Perhaps it’s a mattress store that’s written an article about the importance of a good night’s sleep. Or an athletic goods company that’s published a piece about how the proper running shoe can help marathoners beat their personal records. These types of posts are imbedded in a publication and are designed to mirror the look, feel, and tone of other articles, but in reality, they’ve been paid for by marketers. This kind of paid content is beneficial in a few unique ways. First, it allows you to target the readers of whichever publication best aligns with the target audience for your good or service. It also provides an air of legitimacy for your advertising; if the reader trusts the publication, they’re likely to also trust your content that they find on its pages. Similar in concept to the sponsored content approach, you may also consider placing sponsored posts on Facebook or paying for Google search ads. This is another form of native advertising, which again allows your content to blend in with its surroundings. If someone happens upon a Facebook ad as they’re scrolling through their newsfeed, or sees a search result at the top of their Google results, they’re less likely to be put off in the same way they might be with a more obvious marketing tactic. Since these ads are intended to look like a part of the larger platform, readers don’t feel they’re being “sold” a product or service. When you think of influencer marketing, it’s possible that your mind jumps immediately to the Kardashians or another celebrity with a massive social media following. But the trend in influencer marketing is changing, and many marketers are now moving away from the celebrity endorsement. In fact, in a recent study by Collective Bias, 70 percent of millennials said they’re more likely to buy a product that’s been endorsed by a non-celebrity blogger, rather than a celebrity. This is good news for smaller businesses, who can’t afford the seven-figure endorsement price tag that Kylie Jenner commands. If you’re a small business, think smaller scale. Target influencers who are important to those in your desired network, and reach out to them. If you have a compelling pitch and are willing to send them a free sample of your product, they just may cover your business on their blog or give you a shout-out on their social media platforms. There are a lot of small businesses out there, creating content and competing for the attention of potential customers. While this can make the world of content creation feel overwhelming, if you focus on creating quality content that really helps your target audience, and find ways to get this content in front of an ever-broadening audience, you can make the content creation approach work in your favor to drive revenues and expand your business. If you liked this post, check out the Small Business Guide to Advertising. Facebook advertising for small business is a hot topic, and it’s gotten even hotter since Facebook’s been in the news lately talking about limiting people’s organic reach. This is something that’s been going on for a couple of years, and I think that this whole political storm that kind of crept up made them take it a little more serious and bring it front-and-center. In my view, the bottom line is that it’s going to sell more advertising, it’s going to make you more reliant on advertising. It’s not going to be an awful thing for Facebook; in fact, I tell people — half kidding, half serious — that you should buy some Facebook stock because of this, because if Facebook’s going to stick around, it’s going to because we have become so dependent upon it. So, as a business, it’s still a great, viable place to advertise. But I want to talk about that word a minute, because it’s not just a strict advertising vehicle, it’s a social media and content amplification play as well. It’s a great place to get very low-cost awareness of your business, promotions, and content. If you’re going to be using social media, you need to produce content that creates awareness and drives engagement, particularly blog posts, and post it and promote it on Facebook. I’m going to break this down, and it may be basic for a lot of people, but I think some people need to still understand the moving parts of Facebook for a small-business owner. First and foremost, the ticket to play on Facebook is to have a personal profile. Personal profiles can create pages, ad accounts, and groups. Every personal profile comes with a Messenger, which is a direct inside-of-Facebook messaging component, and every personal profile can also create something called a Business Manager account. For a long time, agencies, people like myself, have had Business Manager accounts, but I believe it’s the tool that every business on Facebook should have. Pages are another component, and for the most part, every business should have a page. A page can also be an advertiser, and it can also have its own Messenger account. Ad accounts are a separate component. 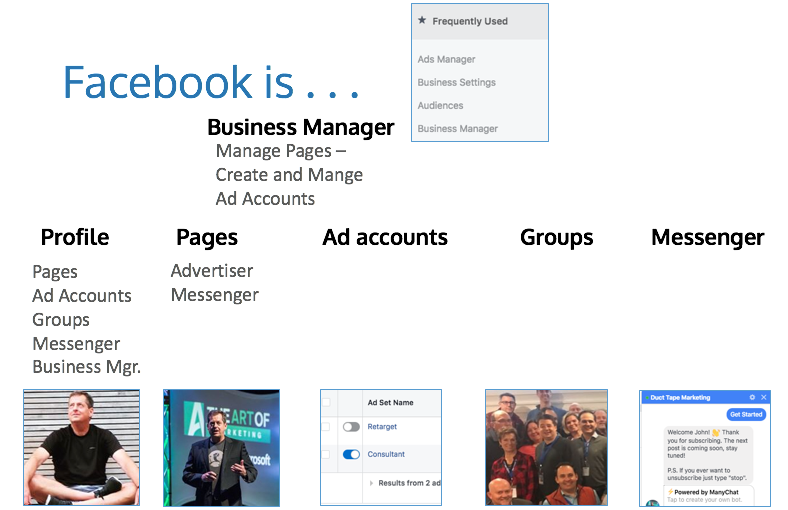 Profiles and Business Manager accounts can create ad accounts, and pages can be advertisers. Anybody with a profile can create a group that can be private or public. Typically, a group is created around specific topics. They are great for community building. Groups are one of the best places to go to plug in and get information, ask questions, and engage folks to help you. Facebook Messenger is becoming more significant because that’s the tool that Facebook is going to use to reach out to the web. In other words, you can use Messenger today as a service or chat. You can install Messenger on your website now. I think a lot of folks will put that on their website because if somebody asks a question, and if they’re logged in to Facebook already, you’ll know who they are, and you can respond. But let’s get into the advertising component of Facebook for small business. First and foremost, you want to have a Business Manager account. Once you have your profile, go to business.facebook.com. With a Business Manager account, you can more securely manage your pages and ad accounts, and today, a lot of people have multiple ad accounts. If you’re managing advertising efforts on behalf of a client, you have to do it inside of the Business Manager. It makes it easier to add employees and agencies and remove them, to give different levels of permissions. You can get by without it, but I think it’s a tool that will make your life better. What I typically am recommending that people do, if you have a page and ad account set up already, is assign those now because that way, you’ll be able to use all the functionality of Business Manager. Once everything is set up, you’ll see a different interface than you’re used to, but it’ll show you the ad accounts and pages that you’ve assigned to it. It also then gives you a great deal of access to building audiences and finding your pixel, as well as using either the Ads Manager or a tool called Power Editor to manage. From there, you can create page post, boost posts, and do a lot of things on this one platform, once you get used to the various components of it. When everything is set up, the first thing I like to do is to go into the ad account, and go into the Assets component, and find something called the Facebook Pixel. Trust me; you’re going to want to go through the process, take the steps, and get the code. You’re going to get a bunch of code that you’re going to have to install on your website. If you’re using WordPress, a lot of themes have a place to install code that will put it on every page, and what that’s going to allow you to do is start using some of the functionality to build audiences based on behavior. In other words, you’ll be able to track somebody visiting your website or visiting a landing page that you created, and you’ll be able to send them different ads based on their behavior. To ensure the pixel is installed correctly, use a Chrome plugin called the Facebook Pixel Helper. You’ll be able to surf to your site and see if the pixel is firing, based on using that tool. There are a couple of standard audiences that I like to create once the pixel is set up. Go back to your ad account, and to the Audiences tab. You’ll want to define an audience that is in a certain city, zip code, and has certain demographics. Save that audience because you’ll have the ability to then promote pretty much anything you want to this targeted group – this is called a Saved Audience. When you go to create an ad or boost a post, you’ll be able to say, “Yes, use that audience,” and so it’ll already be defined and saved. If you’ve got existing customers, you might just want to run campaigns to them, so you are promoting to somebody who already is a customer and who is theoretically familiar with your business. If they’re a customer, it allows you to stay top-of-mind. Another thing you might want to do with that audience is exclude them from your ads. If you’re running a new-customer special, the last thing you want to do is flaunt that in the face of your existing customers, so you might want to build an audience or a campaign, and say, “Okay, promote to these people, but exclude my customers, don’t show this ad to my customers.” It’s a great way to avoid wasting ad dollars. One word of warning in building these lookalike audiences is that you can say, “Hey, I want a big one, I want a big audience,” and there’s a lot of appeal to that, as, “Hey, I want to have more people that I can market to.” But keep in mind, the bigger your audience gets, the less focused it becomes. On top of the custom audience, saved audience, and people that you’re trying to attract, you’ll want to create an audience of people who have visited your site (this is where the pixel is especially useful). For this list, assign any page on your website, and give it a time frame. Keep in mind, the bigger the time frame, the more removed they are from visiting your website. A lot of people will start with a 30-day visit window because those are the hottest folks. Let’s say you start driving traffic to your site, or just boosting content, and having people come and visit your site. With this list, Facebook is going to say, “Okay, I recognize that person,” and now you can start running ads specifically to people who have visited your site. The theory behind that is that they were interested enough to go and read, or interested enough to go and check out an offer, and so you want to stay in their face a little bit and nurture the relationship because they may have just gotten distracted. There are many audiences you could build but I wanted to discuss the standard audiences that we try to build for almost anyone we work with because I think they’re important. Content plays a huge role in the effectiveness of Facebook advertising. You can log in to your Business Manager account, create an ad that says, “Here, buy this stuff,” and blast it out to the world, but we all know that most products and services are not going to be successful if we’re marketing in that format. We have to warm people up and earn their trust for them to get their wallet out. Most often, this is done by creating awareness, understanding that they have an interest, and staying on their radar to the point where they decide that they’re going to buy. If that content is a great blog post that maybe has a checklist associated with it, and you can capture the name and email address of somebody who wants that checklist, that’s a legitimate way to use Facebook. Spend a hundred bucks a month, and with every blog post that you write, promote it for $20 to your saved audience. You’re building awareness and driving traffic that will ultimately turn into some benefit for you. These people will then see an ad that gives them a free trial, or an evaluation, for example. You’re making a determination that because those people watched your first video, clicked on your ad, or went to get your ebook, that they are going to be interested in an even more aggressive offer. At this point, you can start saying things to them like, “If you like the ebook, why don’t you get the $29 course?” which allows you to move them up into something that engages, educates, and allows them to move along the path and the journey. Ultimately, you’re going to go after people who take that action and send them messaging to see how you can sell them your products or services. As you can see, the funnel approach is your typical customer journey. The conversion component may end up being a one-on-one strategy meeting that you’re offering, or some low-cost audit. You’re taking people that have raised their hand and said, “I want to know more,” and you’re moving them along the journey with this approach. The funnel approach is audience-building. It’s a series of ads that are triggered by the fact that somebody took action, and it can be a low-cost way to funnel people to the point at which they want to buy. If you skip these steps, and you just run “Hey, buy my stuff” ads, you’re probably not going to be that successful, and I see a lot of people wasting a lot of money that way because it’s easy to do. The funnel approach takes a little time to set all the assets up, but it’s the kind of thing that you could run and repeat over and over again once you find a formula that works. There you have it! Those are my best tips for getting started the right way with Facebook advertising. I’ve also included some of my favorite types of ads, tools, and further education below that I highly encourage you to check out. There are numerous types of ads on Facebook, but the examples below are what I find most helpful. Today I’m going to address Google AdWords for local businesses. This is going to be pretty prescriptive. I’m not going to try to teach you everything there is to know about AdWords today. I’m going to outline what I think is the best approach for small local businesses, who are probably on a small, local business budget. First things first: Why Google AdWords? Well, the thing about AdWords is that when somebody turns to Google and types in, “I’m looking for X in my town,” the buying intent is very, very high. Showing up on Google Maps or a mobile device when somebody has very high purchase intent can lead to a lot of new business. It’s also a great place for you to balance out your SEO efforts. I’m a big proponent of showing up in search engine results pages because you’ve written great content that is very useful for that thing that people are searching for, but in competitive markets, that’s going to take some time. By filling in your SEO efforts with keyword phrases that you know you’re trying to win, that you know have high-intent or commercial intent, with Google AdWords is a great way for you to ‘stack the deck. It’s also a great way to claim more of the page one real estate. You could show up maybe in the ad; you could show up hopefully in the three pack at some point, or even show up on page one. You overwhelm the page, if you will, by doing this, so it is a great way for you to make sure you are capturing the phrases that you know turn into business. So, how do you get started with it? Do some research first instead of just going out there and saying, “Well, here’s my product, here’s what I think people search for, I’m going to bid for those terms.” That might lead to some business, but it might also lead to you wasting a lot of money. So the first place to look is the competition. Now, that’s not always the person that you compete with across the street or across town that you know of. In a lot of cases, what we’re talking about is the people that are already bidding for the key search terms that you want, that maybe are already collecting business because they are in the number one, two, or three spots on Google for the right search terms. You’ll want to figure out who they are. Click through to where they’re sending people. What does the ad say? What’s the call to action? When you get there, what are they doing to help convert you to a client? Some businesses are an immediate sale, like a plumber. If your pipe breaks, you’re looking to hire a plumber right now. Or let’s say you lose your keys, you’re looking to hire a locksmith right now. Now, there are other businesses, let’s say a remodeling contractor, where remodeling isn’t something that you’ll do tonight, it’s going to be something that you might do over the next couple months. It takes time. So your strategy for AdWords will heavily depend on your industry. Looking at who is already bidding for those terms is a great place to start. Now, if you want to dig in, you can see a lot from what Google shows you, but you can also use a tool like SpyFu, that will not only tell you what people are bidding but also how much they’re spending and how many clicks they’re getting. You can get a real sense of how committed they are to pay per click. In some cases, you’ll find people that are very big SEO competitors and very big pay per click competitors as well, so they’re playing both sides. You’ll also find people who aren’t showing up for organic searches that are very heavily invested in pay per click because in some ways that’s their only option. So, do your homework first. Find out who’s doing what in your community, find out what they’re doing that is converting or at least attempting to convert people regarding landing pages and such. Step number two is to do your keyword research. Now, I talk a lot about keyword research for content and organic search results, but it is extremely important to know what people are searching for when they go out there to find a product or a service that you offer. Again, there are some free tools for this. The first one Google offers us. So if you have a Google AdWords account, you will find in there, under the tools section, something called the Google Keyword Planner. This is a tool that allows you to play around and put in search terms and then discovers related search terms. Discover how much you might have to bid for that search term to discover the volume of searches related to those search terms. Then, you want to start looking at things like related searches. So you even turn to Google, and they will show you searches related to your searches. What you’re trying to do is find keyword phrases that have the most potential to turn into clients. Pay attention to what Google tells you the bid is for those, because in some cases the higher that they’re suggesting you’re going to have to bid, the higher the commercial intent might be. In other words, maybe other people in your industry are ignoring some terms because they don’t ever turn into clients and they’re bidding up other terms because those are the ones that turn into buyers and to clients. There are some other tools you can employ to round out your search. I love one called Answer the Public to find out what questions people are asking for. It’s very tempting in your keyword research to think, “Oh, here’s the three or four phrases that get the most, they get all the volume.” It can be tempting to try to win those, but there’s an excellent chance that they’re going to be much more competitive. Maybe they’ll be a little broad. For example, if somebody’s searching for ‘marketing consultant,’ there’ll be a lot of volume in that term, but do I know if they’re looking to hire a marketing consultant, to be one, to know what it takes from a training standpoint? It’s hard for me to know what their intent is from that search. Now let me go into an area where hopefully nobody from Google is reading because I’m going to tell you how to un-Google your default account. There are a few things that Google has set up to guarantee that you will have to spend more money than you need to, and pretty much stack the deck in their favor. There are a couple of things when you’re getting into there. The first one is campaign type. There are several places that you can show your ads. You can show display ads on their display network, or you can show them in their search network only. For the most part, you’ll want to start with a search network only. Make sure that is the only box that is clicked in your campaign type because otherwise, you’ll get a bunch of junk. The next one is match type. As you’re setting up your keyword phrases, there are ways for you to tell Google exactly what type of match you want to make. The match types show your ads to more people, being very broad in their approach, to being very exact. You have the ability to dial that in, and for the most part you want to be more on the precise, relevant side than the broad side, because people type a lot of weird things in when they’re searching, and you don’t want to get caught up in a whole bunch of clicks that have nothing to do with your actual product. So the default type is what is called the “broad match.” That is the default match type that if you just put a keyword in there, it’s going to get you things that are not related. The graph above goes down the different match types so that you can get more precise with your match types and you can tell Google that if you sell marketing services like I do, that you want somebody who is searching only for buying marketing services. Take a look at the match types. Study it, and remember, for the most part, you want to be closer to modified or exact match. 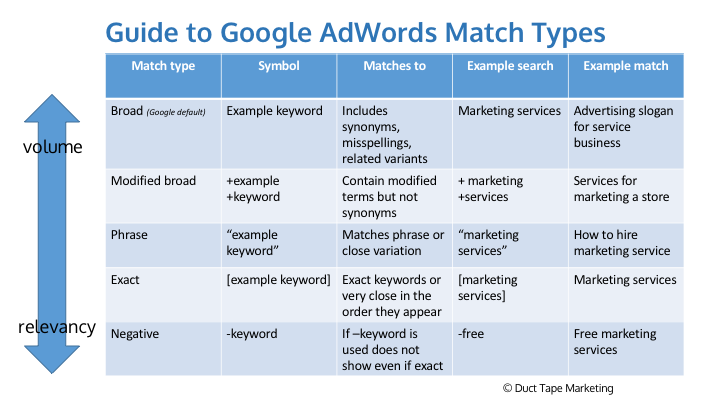 So, broad modified, or exact match, are the ones that you’re looking for. Phrase match is another one that’s kinda in between those two, but never leave it just at broad, or you’ll get a lot of junk. 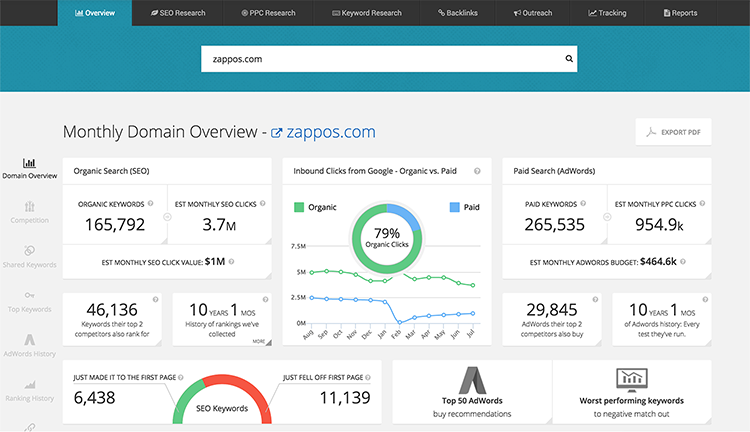 Let’s get into optimizing your campaigns. If you are a local business you want to make sure that you’re very dialed in on the location of your ads. If you serve a full suburban area, you might just want to set a radius. But if there are certain zip codes that you serve, certain zip codes that you know your clients don’t come from, you have a very granular level of setting for location. So you want to make sure that you are setting it up correctly. Location comes back to optimizing our campaigns in our ad groups too. I already mentioned the idea of ‘negative keywords’ in the match types. You want to make sure that you are building a list if you don’t want your ads to show for those. One of the things that you want to make sure that you’re doing is check your search terms tab. As you roll out your campaign, you’re going to find that there are negative keywords that you never thought of. You’re getting some clicks from things that are not related to what you want. So you can adjust that, and you should certainly adjust that as you optimize and continue to look at your campaigns. And this is a point where I probably should throw in; this is not a ‘set it and forget it’ type of thing. You constantly want to be monitoring and figuring out what words are converting, what search terms are converting, because in the end that’s all you care about. My experience is that no matter how well we plan out and strategize, there’s always going to be probably 30-40% of your search terms of your ads that just don’t produce the results that you want. You want to make sure that you are monitoring those in a way to cut the losers and maybe double down on the winners. Now let’s move to ad copy and the things that you can do to make your ads very, very compelling. One of the challenges with Google AdWords, of course, is that you don’t have a lot of real estate. Your headline is 30 characters, and then you get 80 characters in two description lines after that, and then a URL. And that’s pretty much it. You’ve got to grab people’s attention very quickly, so if you’re in one of those businesses where somebody’s intent is very high, they’re going to want to know, ‘how much is this going to cost me? Can I trust these people? When will they get here?’ Those are the kinds of things that you can cram into your ads to get as much information communicated as possible. Don’t forget the URL. One of the tricky things in the URL is that you get to put a display URL and then you get to put an actual URL. The actual URL is where people go when they click on your ad, but the display URL can be just about anything as long as it’s on your domain. That’s a place where you can put some extra keywords in there or maybe some extra branding in that URL. So don’t forget to do that. Test, test, test – no matter how good I think I get at any of this, I don’t always know what’s going to be the best ad. Do your best attempt to write three really great, compelling ads that you think are going to make people want to click. When you run them, Google will rotate them through for you, and they’ll show you the ones that are getting clicked on. Google wants lots of clicks, so they want you to run the most compelling ad. Extensions are another topic around optimization. 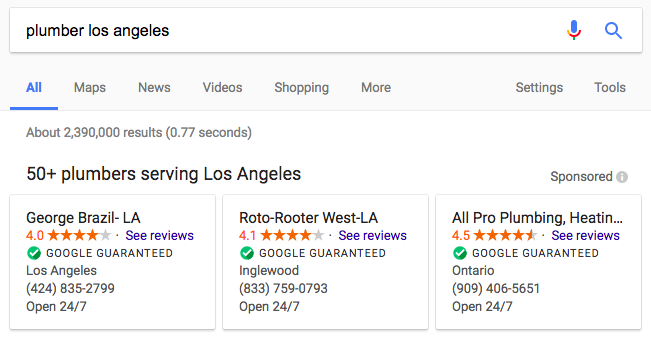 If you enable them, and you should enable as many extensions as you possibly can (there’s a process for doing that in AdWords), Google will make a determination about which of those extensions they show in your ads, dependent partly on the type of search and the proximity of the search and a number of variables. What it ultimately does is it gives you more real estate. It makes your ad look bigger and more prominent. If you’re in a competition, essentially, with two or three, in some cases, other ads, say at the top of the page or even in mobile search, your ad, hopefully, is going to stand out a little bit because you’ve added those extensions to it. Now, if you’re in one of those businesses where somebody’s going to be on their phone and they’re going to want to click to call right away, then you also want to have your campaign set up by device type as well. There is an extension where you can say, “I want these ads to run for mobile and I want them to be ‘click to call.”‘ So in other words, somebody wouldn’t even have to type in your phone number or click and then find your phone number, they would click on the ad and they would then call you. It’s not for every business, and if you’re not one of those businesses that answer the phone when people call day and night, then this may not be for you, but there are a lot of little tricks and settings like that. The last topic I want to cover about is conversion. You want to set it up so that you know precisely what’s working and what’s not working, and the good news is there are a few things that can increase your conversion, and certainly a few things that will help tell you what’s working and not working. The first piece is something we call ‘landing pages.’ Now, I know this isn’t a foreign concept to everyone, but I find very few local businesses that take the time to set up landing pages for their ads. And what this would mean is that if you run an ad for a very specific set of keywords and your ad has very specific copy, the closer you can match the landing page, the page that somebody clicks through to, to what that search term was, or at least what the intent of that search term was, the higher chances Google will give you a quality score, and the ad will convert, or turn somebody into a customer. So if you have different products, different services, different offers, different campaigns that you’re running, it helps to build pages specific to those things. Instead of sending somebody to your homepage where they now have to figure out what it is that they’re looking for or even find your contact information, send them to a page that is very, very related to the ad, to the keyword groups, and has a very specific call to action that is related to what that ad was about. This takes some extra time. You may have to create five or six pages just for your campaigns, but the conversions and the return on investment for your ads spent will go through the roof if you do it. There are a couple of other things we highly recommend, including call tracking. We use a tool called CallRail and what that allows you to do is if you’re in one of those businesses where you’re trying to generate phone calls, or form fills, so if somebody comes to your website and fills out a form, this will actually allow you to know exactly where those are coming from, all the way down to the ad level to the keyword search term that they typed into Google before they picked up the phone and called you. This kind of tracking allows you to eliminate the campaigns that aren’t producing for you and again, if they’re turning into phone calls, you can even record these phone calls, you’ll know if those phone calls were good phone calls or great ideal prospects. You could get it to the point where you can find the campaign, the phrase, that is actually producing clients for you. When you know that, then all of a sudden you can make sure that you bid that up, that you are winning that, that you’re increasing maybe your bids for those key terms and then turning other ones off. That makes you far more competitive for the things that are turning into clients. 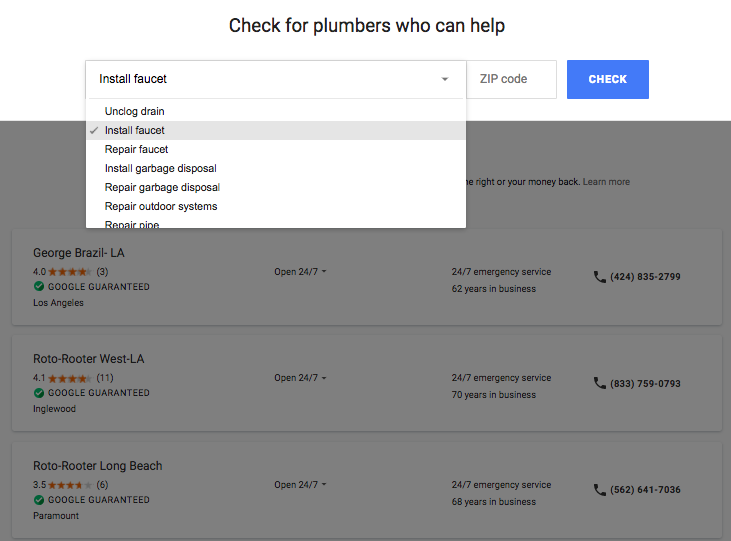 You will also need to connect your Google AdWords account with your Google Analytics account, and turn on something they call ‘auto-tagging.’ This will start immediately as people are clicking on your ads and will start producing campaigns inside of your Google Analytics that will help you show what clicks are producing what results. One of the things that you’ll want to understand and learn how to create are conversion goals in Google Analytics. A simple goal might be to fill out a form or click through to another page where they can find out how to buy that product or service, and by taking that action, they are completing that goal. Those conversion goals can give you very, very precise information about what your ads are doing regarding goals and achieving those goals. Like this post? It’s part of our Ultimate Guide to Local Marketing and our Small Business Guide to Advertising. With more than 2 billion monthly active users, Facebook has grown to become the kingpin of social media platforms. No matter what type of business you’re running, Facebook has an audience for you. Facebook’s Advertising platform provides tons of Ad targeting options that enable you to precisely define your target audience and reach them, no matter where they’re located, what they do or which device they use. Custom Audiences is one such amazing targeting feature. If you haven’t tried it yet, Custom Audiences are lists of Facebook users who have interacted with your business in the past and are part of your audience. They may be your existing customers, blog readers, website visitors, or even your top clients. All you need to do is simply provide Facebook a list of user emails, user IDs, or phone numbers and it will automatically create a custom audience for you. The cool thing about Custom Audiences is that it allows you to reach your website visitors, customers & email subscribers when they’re on Facebook, and engage them with your Facebook Ads. Once you provide a list of target users to Facebook, it will automatically find them in its massive user base and display your Ad. This enables you to not only promote your business to the right people but also improve click-throughs & conversions, as well as optimize your Ad spend. Here are 5 Ways you can use Custom Audiences to increase the reach of your Facebook Ads. How can you reach people who don’t read your emails? You can upload a list of all your subscribers who haven’t opened your emails, to a create custom audience. Then target them with their own Ad campaign which contains the same message that you had sent in your email. This way they’ll see your message in their news feed and you’ll be able to reach them, even if they missed your emails. Did you know that you can reach your LinkedIn connections using Facebook Ads? In LinkedIn, you can download a list of all your connections as a CSV file, along with their email addresses. You can use this list to create a custom audience for your Facebook Ads. This is a great way to drive your LinkedIn connections to your website and persuade them to subscribe to your blog, try out your products & services, or even make a purchase. If you run a B2B business, it’s a useful way to reach prospective clients and nurture leads. If you have a product or service that offers free trials, you can use custom audiences to reach out to those trial users who haven’t subscribed to your product or service yet. From your email list that contains all the sign ups, you can remove the emails of all those people who are now your customers. This will leave you with a list of emails of those people who have trialed your product or service but haven’t subscribed yet. You can use this list to create a custom audience, whom you can target by providing discounts and offers, to subscribe to your products & services. 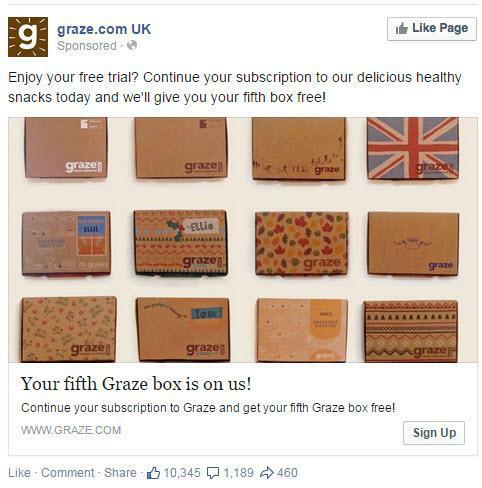 Here’s a great example of how Graze, a healthy-snack delivery service, uses this tactic to reach trial users who haven’t subscribed yet, by thanking them for considering their service and offering an incentive become a paying customer. Did you know that you can even create a custom audience based on which page people have visited? This is a very nifty feature that you can use to target each traffic source individually. First of all, create separate landing pages for each source of traffic (e.g Google, Facebook, Twitter) and then create separate custom audiences, one for each landing page. Finally, create Ad campaigns based on the landing pages that people visit on your site. Have you noticed Facebook Ads of websites that you’ve just recently visited? 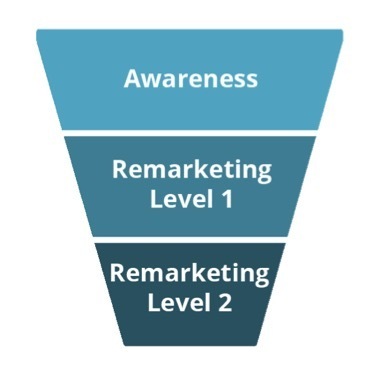 They may seem like magic but they’re called remarketing ads. Once you install the Facebook remarketing code on your site, when a person visits your page, it informs Facebook about it. Now when the same person uses Facebook, he is shown your ad. Although remarketing ads appear a little creepy at first, they are one of the most effective ways to reach out to people who have recently visited your website. In fact, Facebook Remarketing ads get 3X more engagement than regular Facebook Ads. How is this related to custom audiences? Well, remarketing campaigns only work on custom audiences. You can create a custom audience to target people who haven’t visited specific pages on your website, in awhile. For example, if you run a grocery store, you can use custom audiences to retarget people who haven’t visited your site in the past couple of weeks, to remind them about their weekly shopping as well as loyalty points. If your blog gets a lot of monthly traffic, you can create a custom audience to retarget them, to sell your products & services. For example, a women’s fashion blog can retarget its readers, to sell its own range of products (hair dryers, lipsticks, etc) or even third party products (using affiliate marketing). You can even create separate custom audiences to retarget your readers with separate ad campaigns, based on the type of content they read on the blog. For example, people who read about hair styling would be retargeted with hair products. You can create custom audiences to retarget to your existing customers, to bring them back to your website, and upsell them. For example, if you run an online store that sells laser printers & accessories, you can retarget all users who have purchased a printer from your site (viewed the payment confirmation page), with Facebook Ads about printer ink cartridges, or maintenance service. Similarly, you can also retarget users who visited your checkout page but did not complete the purchase, that is, abandoned their shopping carts. 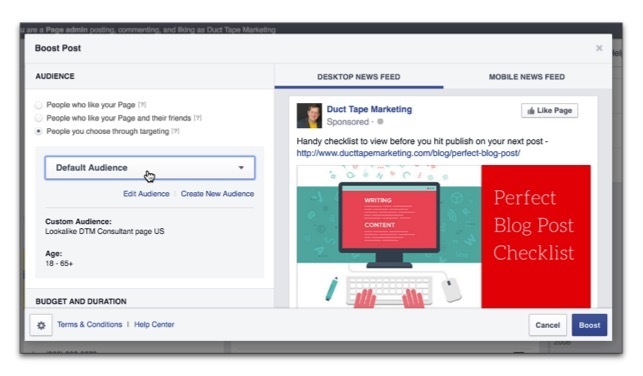 Recently, Facebook has launched an amazing new ad format called Dynamic Ads, that allows you to dynamically change Ad contents, based on users’ behavior on your website. It’s a great way for E-commerce businesses to show carousel ads of their products, which the user just viewed on their site. It allows them to promote all their products in a single ad campaign, and since the ads feature products that the users have seen before, it leads to better conversion & click-throughs. In fact, Facebook’s Dynamic Ads use the same remarketing code as custom audiences, with minor customization to pull in the product ID. Custom audiences also allow you to create retargeting lists comprising of users who have completed specific actions on your app. For example, if you have a food ordering app, you can create custom audiences to retarget people who have ordered using your app in the past 14 days, offering them a 10% discount on their next order, if they order today. It’s a good idea to install the Facebook Pixel on your website/app, even if you don’t intend to use Custom Audiences immediately. This will enable Facebook to gather adequate data about your website visitors, and optimize your ad reach, whenever the opportunity arises. In fact, you can even create some basic custom audience lists simply to get an idea of their reach and ad budget. Hopefully, these ideas will help you increase your Facebook Ad reach and engage your audience more effectively. For more than 8 years, Sreeram Sreenivasan has worked with various Fortune 500 Companies in areas of Business Intelligence, Sales & Marketing Strategy. He regularly writes at the Fedingo Blog about a wide range of business growth topics. He’s also the Founder & CEO of Ubiq BI, a cloud-based BI Platform for SMBs & Enterprises.